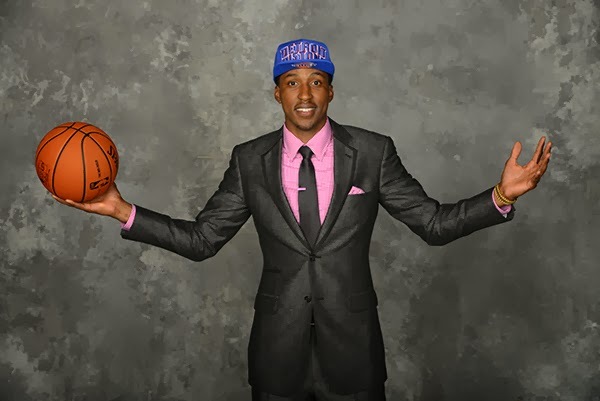 Joe Dumars surprised a lot of Pistons fans when he selected Kentavious Caldwell-Pope 8th overall in this year's draft. Most thought that Trey Burke was the obvious choice, brought in to replace Brandon Knight. But whether or not Dumars was always planning on acquiring Brandon Jennings as the team's point guard of the future, KCP was the correct choice. What we know: KCP was an efficient, highly athletic scorer for Georgia for two years, improving significantly during his sophomore campaign. Shooting 37% from outside during his sophomore year, KCP became a reliable outside threat, opening up driving lanes for his NBA+ athleticism. Though lacking a quality handle (he average 2.0 turnovers per game last year), he is able to get to the rim and rise above defenders to finish. Defensively, his quickness and jumping ability allow him to be an expert rebounder for his size and a decent shot blocker, all of which has been on display in the summer league and pre-season games. In trying to find close NBA comparables, I pulled up what seem like relevant stats for KCP and matched him against who I believe to be his closest NBA forebearers: Aaron Afflalo and Danny Green. All three are 6'5"-ish shooting guards with elite-level athleticism, non-stop motors, and floor-spacing abilities. If the Pistons are able to generate Afflalo/Green-like production out of KCP this season, the team could be in good shape. A few caveats: Afflalo played three years of college ball and Green played four. KCP only stayed in school for two seasons, so while the above charts can be calibrated up in favor of KCP's potential, his transition to the NBA game may take a bit more work. And that's where the real trouble comes in: Neither Green nor Afflalo were very good their rookie seasons. Green didn't play much for a terrible Cleveland team and shot only 27% from outside and posting a 12.39 PER. Afflalo struggled similarly for the Pistons, shooting only 20% from outside and posting a 10.8 PER. At this point in their careers, both players shoot over 38% from outside and are staples on their respective teams, but that was not without early-career struggles. The positive outlier from those charts, however, is the free throw rate, where KCP excels. He has proven adept at drawing defenders out to the three-point stripe, pump faking, and driving to the rim to draw fouls. This is a dimension of his game that could prove to be most important this season. With defenders packing the lane against Detroit's frontcourt, KCP will both find space to shoot and ample opportunities to drive by overzealous defenders. Mo Cheeks likes veterans, which designated the starting shooting guard spot to either Rodney Stuckey or Chauncey Billups. With Stuckey's recent injury and Billups' history of them, KCP will find plenty of time in the rotation. KCP has struggled with his outside shooting early, which is a crucial skill for this Pistons' starting lineup to have. As the season progresses, expect his outside stroke to even out a bit and for his athleticism (and Chauncey's lack thereof) to force KCP into the starting lineup. In the long term, it means the Pistons probably found their shooting guard of the future, the player the franchise has been searching for since drafting Rodney Stuckey. In the short term, there could be some growing pains for KCP and the Pistons. With persistent shooting woes, the viability of KCP in the starting lineup remains in doubt. If he can develop his outside shot, he should enter the starting lineup sooner than expected. But eventually, he'll be forced there through injury or subpar play from Billups.